This time of year is referred to as the ‘season of giving’. Charities report that 31% of all charitable donations happen in December each year and that 12% of donations occur on the final three days of the year. There is good reason to believe that those percentages will increase dramatically in 2016. Proposed tax reform, which seems likely to pass during 2017, means that December 2016 is the equivalent of a one-time-only liquidation sale for charitable giving. Unlike the seemingly permanent promotions at popular retailers, this one has a short window for the average consumer. Fortunately, you don’t have to be a multi-millionaire with a private foundation to lock in these ‘discounts’. 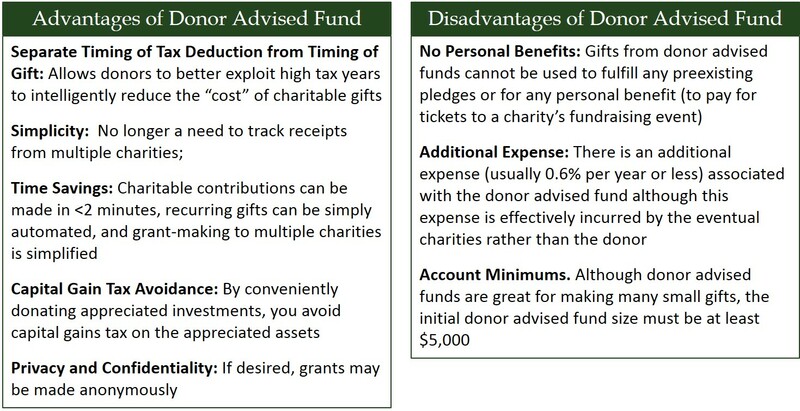 A simple and underutilized tool – the donor advised fund – allows taxpayers to get an immediate tax deduction without making large, one-time gifts to targeted charities. The classic tax planning rule of thumb is to defer income and accelerate deductions. Like other rules of thumb in finance, this one often leads to bad decisions when applied universally. Yet in situations where the taxpayer is transitioning from a high income year to a low income year, the traditional rule of thumb tends to be a useful guide and can lead to significant tax savings. For the majority of taxpayers, income and deduction items can be challenging to move across calendar years. The inability to control the timing or amount of deductions and income can limit tax planning opportunities. There is, however, one deduction that tends to be most discretionary in its timing and amount – the charitable deduction. Long a component of the tax code, the charitable deduction allows taxpayers who itemize deductions to take advantage of what amounts to a matching gift by the IRS. Giving $1,000 to a targeted charity effectively only costs $650 for a family in the 35% marginal tax bracket (Gift Amount x (1 – tax rate)). The charity still gets the full $1,000 while the remaining $350 is covered by the US government in the form of a $1,000 tax deduction. The higher the tax rate of the taxpayer, the larger the government subsidy is. If a taxpayer’s marginal tax rate was consistent each and every year, then the government subsidy (in percentage terms) would stay the same. But consider an environment where someone’s tax rate is changing. This may happen when a taxpayer earns a large one-time, non-recurring bonus. An extreme example occurs when someone transitions from a high paying job into retirement. If this individual retires without a pension, before age 70.5, and before Social Security has been exercised, then the change in tax rates can be dramatic. It is not uncommon for an individual or family in this situation to go from a marginal tax rate in excess of 40% to a marginal rate of 15% or less. Now consider the implication of this scenario for charitable giving. If this taxpayer goes from a marginal tax rate of 40% to a marginal rate of 15%, this government subsidy shrinks dramatically. It is the equivalent of walking into a store one day when everything is 40% off while the next day, the sale is only 15%. Instead of getting a deduction worth $400 for a charitable gift in the final year of work, the taxpayer in this example only gets a deduction worth $150 in the first year of retirement. None of this is to say that the size of charitable contributions should be determined or even driven by any tax benefit. It is, however, to say that the timing of charitable gifts – even separating them by a matter of hours – can often be optimized to have a profound impact on the power of a gift. The current political landscape presents an environment where not just people transitioning to retirement or a lower income year will benefit from deferred income and accelerated deductions. In fact, the likelihood of 2017 tax reform means that nearly all high income families or individuals will benefit more than usual from deferred income or accelerated deductions. The House GOP plan and the Trump tax plan have their differences but they share two common themes: significantly lower tax rates for the wealthy and limits on itemized deductions. Any combination of reduced tax rates, a higher standard deduction, or limits on itemized deductions in 2017 will mean that 2016 deductions are more valuable than usual. Consider, for example, what happens if the standard deduction for a married couple is increased from the current level of $12,600 to the $30,000 level proposed in the Trump tax plan. A family paying taxes at a 30% marginal rate with $20,000 of itemized deductions plus another $8,000 of charitable gifts currently gets nearly $2,500 of tax savings from their charitable giving. If the standard deduction is increased as proposed, this hypothetical family gets zero tax benefit from their charitable gift (because the new standard deduction exceeds their itemized deductions). What if a taxpayer wants to take advantage of the likely tax reform set to take effect next year but does not necessarily want to make a large one-time gift to targeted charities? Moreover, what if a high income tax payer about to retire in the foreseeable future wants to make use of the more valuable charitable deduction now but likes to spread the actual gifts to targeted charities over multiple years? There is an easy solution – the donor advised fund (DAF). Donor advised funds have become widely popular in the past decade – so much so that they now account for nearly 5% of all US charitable giving. There are several advantages of a DAF but the core benefit is simply the ability to separate the timing of the charitable deduction from when the targeted charity or charities actually receive the gifted funds. Said differently, the DAF allows donors to receive an immediate tax deduction for the full value of donated assets but then make gifts to one or several charities based on the preferred timetable of the donor – sometimes many years into the future. This ability to separate the timing of the deduction from the underlying gifts presents an opportunity to front-load deductions in the year or years when the deductions are most valuable. Perhaps you generally give away $5,000 each year to charity and that you also have unusually high income this year which is unlikely to be repeated in the future. One tax-smart strategy would be to pre-fund several years’ worth of giving in the current year – say $25,000. You get the immediate $25,000 deduction in a year when the deduction is more valuable and the money sits in an account where you can easily distribute $5,000 each year over the next five years to targeted charities. Nothing changes for the targeted charities and you simply get a more valuable tax deduction. The other extremely valuable benefit of the donor advised fund is the ease of donating appreciated assets. By donating eligible appreciated assets directly to a charity or DAF, the taxpayer gets credit for the fair market value of the asset and avoids any future capital gains tax – effectively eliminating the embedded capital gains for tax purposes. Although most taxpayers fail to take advantage of this opportunity, the avoidance of capital gain taxes by giving securities in lieu of cash or check can be one of the most significant tax saving strategies available. While a donor could give appreciated assets directly to a charity without the DAF and achieve the same result, sometimes this is practically infeasible. Smaller charities may not be set up to handle receipt of donated securities. Moreover, the hassle of donating appreciated assets for every $100 or $500 gift is often not worth the benefit. A DAF facilitates the donation of appreciated securities by allowing a donor to make a single donation of appreciated assets (although it does not have to be just one) and then spread the proceeds to numerous charities of any size and in any amount. With the likelihood of tax reform in 2017 to lower federal tax rates and limit deductions, the front-loading of charitable deductions via donor advised funds stands to be a popular tax strategy over the final weeks of 2016. More people may benefit from a donor advised fund in 2016 than usual but these vehicles will continue to have significant utility in future years for the same reasons that they have been useful (albeit underutilized) in the past.